Heat Shrinkable Kynar Tubing is an irradiated, thin-wall tubing offering a high degree of mechanical strength and high temperat ure resistance. Kynar tubings are fabricated from polyvinylidene fluoride which gives outstanding abrasion resistance and cut-through properties in combination with high dielectric strength. Kynar is inherently flameretardant and semi-rigid. It is highly resistant to most industrial fuels, chemicals and solvents. Kynar tubings shrink at 350°F on applications such as jacketing for components, fuse coverings and capacitor protection. 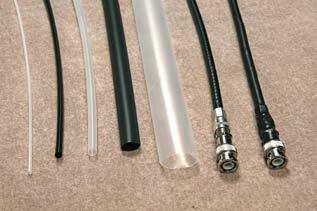 Because the tubing is transparent, it offers see-thru inspection and identification. Heat Shrinkable Kynar is excellent for strain relief applications. It can be flexed, twisted and bent repeatedly without loss of mechanical or electrical strength. Because of its thin wall, Kynar can be used in areas where space is limited.